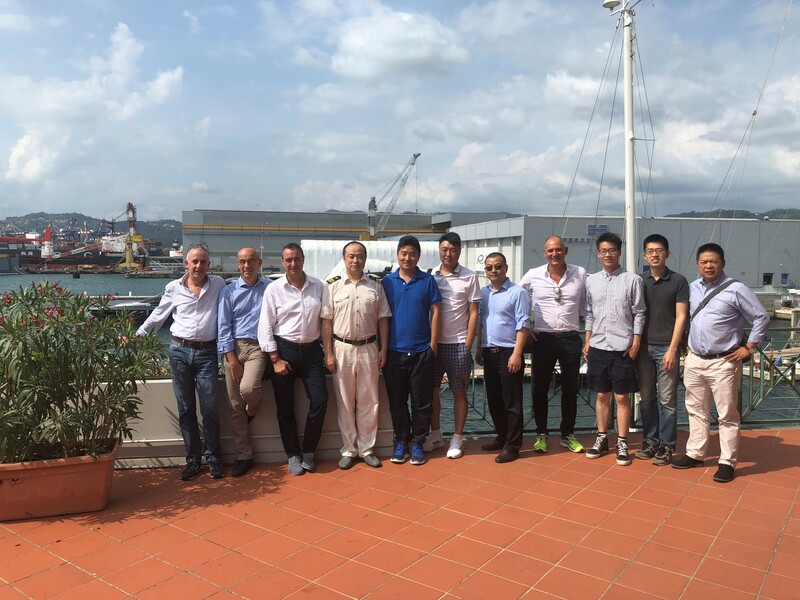 From Shanghai to Valencia, on board of Cosco Netherlands containership to report about the New Silk Road initiative and effects on trades between China and Italy, a delegation of Journalists visited La Spezia Container Terminal on Saturday 25th. On Saturday 25th August a delegation of journalists from CCTV - China Central Television, China Daily newspaper and Xinhua News Agency, accompanied by Cosco Shipping representatives in Italy, stopped in La Spezia to visit the Contship container terminal, and witness the developments of traffic in import and export from/to Italy and Europe, in the context of New Silk Road project. The visit has been a great opportunity for Contship management to describe the role of La Spezia as gateway port, not only for the markets of Northern Italy, but increasingly as an alternative to the ports of Northern Europe, as gateway to/from Central European markets, in particular Switzerland and Southern Germany. Looking at H1 data in 2018, the import flows (number of teus) from China to Europe, via La Spezia, increased by 4% compared to 2017. During the meeting the journalists – who boarded in Shanghai and will disembark in Valencia, after a journey of about 30 days – were able to observe the operations of the terminal and learn more about the role of La Spezia in support of trades between China and the main economic and industrial areas of Lombardia, Emilia Romagna, Tuscany, Triveneto and beyond the Alps, with Switzerland and Southern Germany. The meeting was organized with the support of the Cosco Shipping operator in Italy, represented by Mr. Yin Yongwen (Operations Manager), Mr. Song Aaidong (Administration Manager) and Mr. Roberto Terebinti (Operations Deputy Manager). Operations Director, Mr. Davide Romanengo and Customer Service Manager Mr. Roberto Scotto participated for La Spezia Container Terminal, while Mr. Daniele Testi, Marketing and Communications Director, represented the parent company Contship Italia. "These meetings are very important - said D.Testi - because they offer Contship Italia group the opportunity to directly present to the Chinese press the commitment and challenges that ports and logistic operators have to match every day, to serve efficiently and effectively the dynamic Chinese market. This includes a necessary effort to adopt new communication systems, use new languages ​​and develop new contents, in tune with the interest and the preferences of the Chinese audience; this is a difficult, but fundamental challenge. The Contship Italia Group decided years ago to invest time and energy to promote its integrated service offer of container terminal and intermodal transport operations, directly in Asia, trying to foster a greater understanding of available opportunities, also to support a deeper penetration of Italian products within these markets. We would like to thank Cosco Shipping for this opportunity, and for their choice to include the La Spezia Container Terminal among the tour stops". If you are interested in reading the latest news and analysis regarding the Southern gateway logistics system, and the Contship Italia world, you can subscribe to CS WINdow, Contship quarterly newsletter, available in Italian, English and Chinese.